Keeping a nice yard can be a lot of work. 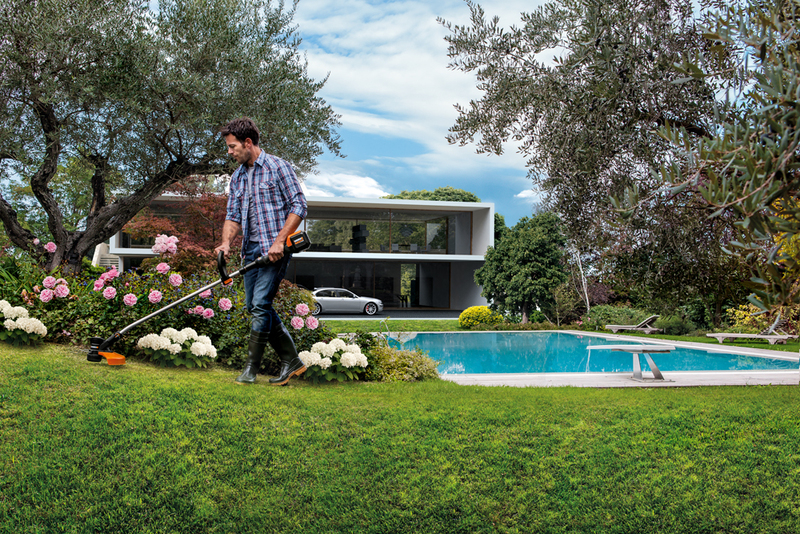 With the right tools, you can certainly reduce the amount of time and effort you spend maintaining your yard. But, you’ll still have to consider your options when it comes to yard tool storage. If you have already spent some time on garage organization, storing these tools might be easy. However, there are some yard tools that need special consideration. If you have tools like an electric string trimmer or a cordless hedge trimmer, you might need to add some new elements to complete your garage yard tool storage. Here are some of our best yard tool storage ideas for people looking to get things organized and make the most of the space they have. They include inputting wall racks for long tools, hanging wire racks, installing a pegboard, and putting up ladder and power tool storage sections. Tools like rakes, shovels, and brooms can be useful when it comes to maintaining your yard, but the long handles can make them hard to store. If you’re tired of having tools like these leaning against the wall or off in a corner, wall racks are a great yard tool storage idea. With some racks on the wall, you can easily hang these tools up. They’ll be out of the way in a place where you do not have to worry about knocking them over. When it comes to implementing this garage organization project, one option is to build a rack that has slots for each tool. This can be a good solution because it keeps the tools securely on the wall, but there is an easier option for building a yard tool storage rack. You just need to mount some strips of wood on the garage wall and then mount some hooks to the wood. This is a simple garage organization idea that can be completed in very little time. Best of all, it offers a convenient place to store yard tools that have long handles. If you’re looking to improve your yard tool storage, you have several garage shelving options available. You could build your own shelves if you have the time, but wire shelves offer an effective and convenient solution. Wire shelves are affordable and easy to install. Along with that, they’re a highly adaptable garage storage piece. You can buy wire shelves that are freestanding, or ones that mount on the wall. They can be great for storing yard tool accessories like batteries and chargers for power tools and replacement string trimmer line. If you have a lot of hand tools for your garden and yard, finding a place to store them all can be difficult. For a simple solution, you can look to a garage storage idea that is commonly used for other hand tools: pegboard. Simply mount the pegboard to any open area on the wall and add some hooks. Now, you have a garage storage space that’s perfect for keeping things like hedge clippers, trowels, loppers, and weeding forks. If you own outdoor power tools, you already appreciate how much easier they make yard maintenance. While they do make your outdoor chores easier, storage can often be an issue. For these tools, building a rack on the wall can be one of the best yard tool storage options. A wall-mounted yard tool storage rack can be good for storing items like string trimmers and hedge trimmers. It’s also a smart way to keep these tools off the ground and out of the way. If you are working with tools like the GT Revolution 20V String Trimmer/Edger/Mini-Mower or the 20V AIR Cordless Leaf Blower/Sweeper, you could consider buying the wall-mount tool holders that are specifically made for these tools. This type of garage storage shelving is easy to install and can be great for storing a wide range of cordless and electric yard tools. A tall ladder can be an essential tool on jobs like cleaning your gutters or trimming high tree branches. Unfortunately, they can take up a lot of space in the garage. If you want to keep your ladder safe and out of the way when it is not in use, consider some overhead garage storage ideas. One simple solution is to just install ladder hooks in the ceiling of the garage. Alternatively, you could get some wood and build an overhead rack for storing your ladder. With tools like a cordless circular saw and your drill/driver, you can build an overhead rack that makes it easy to keep your ladder out of the way. Once you have the rack built, all you have to do is slide the ladder in to store it away. It will slide out just as easily when you need to use it. Yard tool storage doesn’t have to cause a headache. With these simple garage storage ideas, you can keep your Worx tools well-organized and out of the way. Inputting wall racks for long tools, hanging wire racks, installing a pegboard, and putting up ladder and power tool storage sections.